"This is a fantastic Vietnamese dish that's great for absolutely any occasion, from weeknight dinners, to parties and BBQs, or even a night in front of the television! The chicken wings have succulent flavour and soft tasty meat that melts away in your mouth. They're crispy on the outside, but soft inside and guaranteed to be a success. They've never failed to impress!" Place the chicken wings, garlic, and onion into a large bowl. Pour in soy sauce, fish sauce, lemon juice, and sesame oil. Season with salt, pepper, garlic powder, and sugar; toss together until well coated. Cover and refrigerate 2 hours to overnight. Preheat oven to 400 degrees F (200 degrees C). Line a 9x13 inch baking dish with aluminum foil. Remove wings from marinade, reserving extra. Arrange wings in a single layer over bottom of prepared dish. Bake in preheated oven, turning once and brushing with reserved marinade, until deep, golden brown and meat juices run clear, approximately 30 minutes. The perfect wings for people who love spicy orange takeout chicken! this is the first time that i'm rating a recipe & i give it an A+! my family just loved it! thanks for sharing! 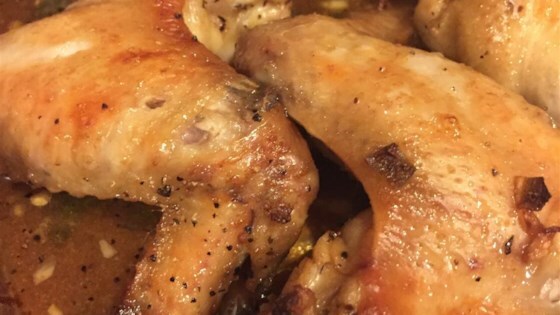 This is the best chicken wing recipe I have ever tasted. The layering of flavors is incredible!!!! 30 minutes wasnt' enough time to cook them. Took an hour for the crispy effect. But still good nonetheless. Easy and tasty. I put the wings under the broiler for a few minutes to make the wings a little more crispy. They were wonderful. Great flavor but felt a little greasy, a crispier finish from some direct heat would move this up to five stars.